I recently returned from a trip to Florida. 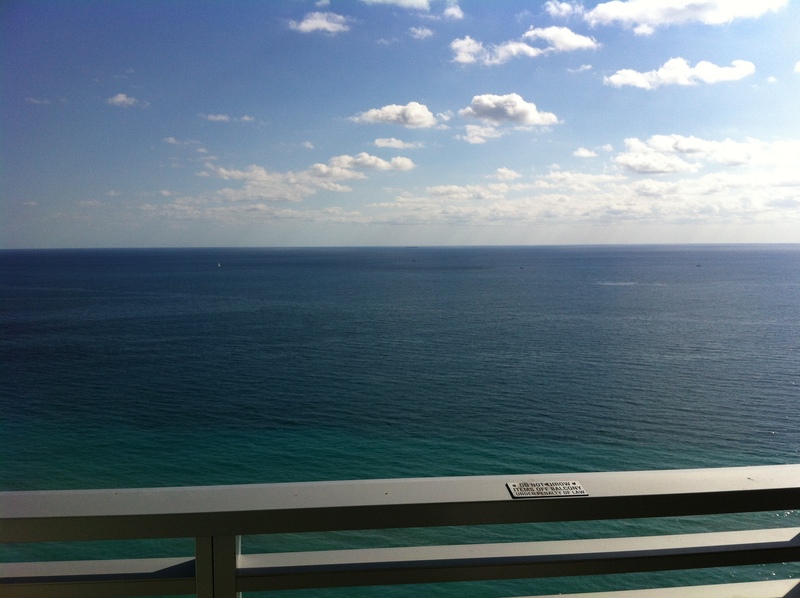 An industry conference brought me to The Sunshine State and since my folks spend their winters there, I tacked on a couple of days to visit them. This trip produced a number of blog-worthy moments. But many of them could be considered incriminating to myself or others, so I’m just going to share with you some random and relatively harmless vignettes. Generally, when I travel for work, I end up in a room overlooking a rooftop and related heating and cooling systems or perhaps hotel rooms in another wing of the hotel. A consistent problem when I travel is what to do about my caffeine addiction. As you may have gathered from my confession about drinking coffee in the shower, I need my morning cuppa merely to cope with the onerous task of getting showered and dressed. I’m also very particular about my joe. My standard coffee is a dark roast, brewed strong (brewed coffee should be completely opaque), diluted with a generous splash of half-and-half, with the addition of a teaspoon of sugar (regular old sugar, not some new-fangled substitute) and a teaspoon of Ghirardelli ground chocolate. Sugar and chocolate are optional (though preferred), but half-and-half is not (although cream, whipped cream and ice cream can be used in a pinch). Bailey’s is also an acceptable substitute, but not recommended on workdays. And guess what? 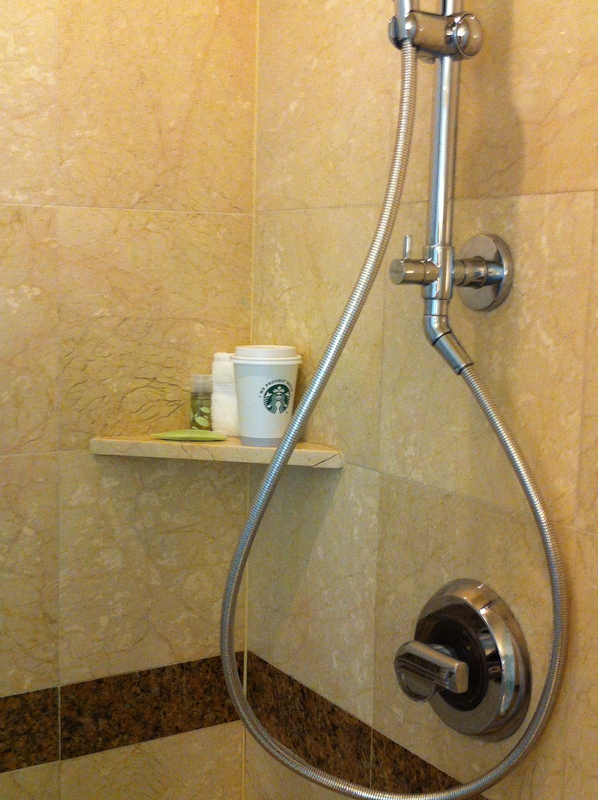 This Westin even had a coffee shelf in the shower! At our industry conferences, we typically host dinners for clients and prospects and this event was no exception. The last evening, we hosted a large dinner party. We had rented out the lounge of a fine-dining establishment and planned a generous menu of wine, seafood and other delights. For transportation, our event manager arranged for pontoon boats to shuttle guests to the restaurant along the intercoastal waterway, so everyone could enjoy the beautiful evening and see the various mansions that line the route. Everything was carefully planned to ensure a lovely evening. Being on the first pontoon to arrive at the restaurant, I ducked off the boat and headed to the restroom to see how windblown my hair was after the boat ride. That’s when things took an interesting turn. I opened the ladies room door to two strippers changing clothes. How do I know they were strippers? Well, to be honest, I’m merely making a judgment based on visual evidence: Fur thigh-high boots, sequined bra, hot pants. You decide. Our intention was to provide a first-class experience for our guests, so this was an unexpected wrinkle. I stood outside the restroom sending panicky texts to our event planner and sales staff. I wasn’t sure whether they were changing into or out of the attire mentioned earlier, and I was trying to decide whether I should act shocked or amused if the women walked out in full regalia and were spotted by our guests. But eventually the ladies left in their street clothes (vs. street walker clothes) and I breathed a sigh of relief. Crisis averted. Oysters were served in a giant tub, shrimp cocktail appeared on a ceramic elephant two-feet high, and desserts were served out of a giant silver spoon. (The same size as the tacky wooden one in my mother’s kitchen!) Everything was completely over-the-top in the blingiest, Miami Vice sort of way. Ironically, the whole experience became the night’s entertainment–an unexpected bonus. The food was great, our guests were jovial and a good time was had by all.